Last month, Special Needs Jungle helped promote a campaign to change a vital part of the children and families bill. I asked Tania if SNJ parents could request the Prime Minister to strengthen the bill, so the most severely disabled children could get the social care they needed. Well, it looks as though the campaign, together with others, has made a difference! Apart from the people from SNJ who took part, the National Autistic Society presented a petition to Minister Edward Timpson which had, at last count, 15,000 signatures. 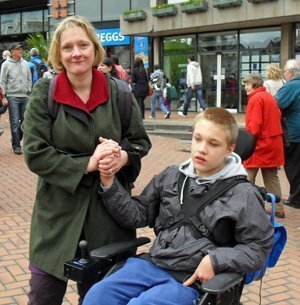 The Every Disabled Child Matters campaign got 1409 parents to email the Minister directly, and Mencap’s parliamentary lead, Rob Holland, worked tirelessly behind the scenes, lobbying MPs and peers. What has been achieved? Firstly, the government has added a clause which confirms that local authorities are under a duty to provide the social care in the EHC plans. Councils can still argue that they don’t have enough money to fund the care, but it will be more difficult for them to do this, as parents will have a clearer idea of what they are entitled to. The government proposes to amend the code of practice to specify the duties which are on local authorities to provide social care. Secondly, the government has proposed a pilot scheme looking at whether a single point of redress from all aspects of EHC plans is feasible. (The details of the pilot are yet to be worked out). Mediation will now also be possible in relation to all parts of EHC plans, not just education. I would have preferred to see a single point of appeal in the bill now, rather than leaving in place the three separate procedures we have at the moment; particularly as the social care procedure is not fit for purpose. However, a pilot is a very positive step. The bill will go back to the House of Commons on 10 February for approval, before receiving royal assent. Along with the fact that the code of practice is being redrafted, there is still therefore room for change. The concessions made by the government represent a significant shift from the position it adopted when the parliamentary process began. There have been many other shifts. It has been moving and uplifting to see what parents and charities can achieve, when united in a cause they believe strongly about. Democracy can be made to work. Thank you SNJ and followers for your part in this. We'll be emailing you for your address very soon! Congrats! IPSEA also welcome these amendments with caution. We have been very active in pushing this point with Government – a real changing point came when the Tribunal confirmed to us that, given the right resources, they would be able to deal with appeals across all elements of a EHC plan. We then passed this information onto to the DfE. It meant that any argument re the Tribunal’s capabilities could no longer be used as an excuse to block this step forward. We would feel more comfortable with this on the face of the Bill rather than as a pilot. It also needs to be emphasised that as far as Health and Social Care needs/ provision is concerned the Tribunal’s decisions will not be binding but be a very strong recommendation from the judiciary based on the evidence before it. It would need strong evidence to ignore such a finding but a LA or Clinical Commissioning Group could do that if they wished. What would happen then I suspect we will need to establish. Thanks for commenting, Jane and for all your amazing work that you and your team at IPSEA have done to improve this Bill. Where would we (and thousands of families) be without you? Why do you think it has been added as a pilot and not included in the Bill? Caution in case it can’t be done or a lack of commitment to it happening?